It was cool but dry in Spa today and the qualfying session ran accordingly, with the McLarens having a slight edge over the Ferraris. That fits with the suggestion in my last post that races this year are being decided by track temperatures and the resultant reactions of the cars to their tires. With cooler weather we should have had a McLaren in pole position and so it proved, Hamilton grabbing fastest time in Q3 with apparent ease. Practice times have been showing the Ferraris to be quicker, however, and one is left wondering whether the McLaren boys were sandbagging a bit until the important moments in qualifying. 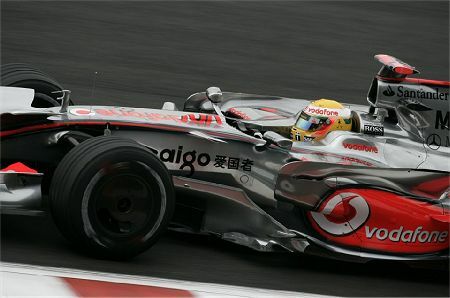 Certainly, it seemed that Kovalainen had joined the two in form, Hamilton and Massa, in being quite capable of pole. The fact that the supposed master of Spa, Kimi Raikkonen, was pushed down to fourth serves to underline both his current problems and the ascendancy of the trio in front of him. As Raikkonen has struggled to equal his reputation lately, so has Kovalainen run into a sweet patch of form and reliability. If this continues, Heikki could well steal the occasional pole from his team mate, although Hamilton will probably remain superior in the races themselves. And, unless something unusual happens in tomorrow's race, Kimi will end up supporting Massa in the last few rounds of the championship battle. It may well have been fuel loads that decided the positions on the grid today but, if so, it seems odd that Kimi would keep plugging away with more fuel than Massa, given the poor results this policy has given him so far. It seems fairly obvious that the few extra laps he gains for the first pit stop have been insufficient to compensate for the gap those in front of him have managed to build in the meantime. Fuel load will also be the reason given, no doubt, for Heidfeld's performance in grabbing fifth spot, ahead of Kubica in eighth. This would be a reversal of BMW's usual tactic and may well be a way of giving Nick one more chance to show what he is made of. If so, he has responded well, being quick from the start of qualifying right through to the end and getting amongst the Ferraris and McLarens in Q1 and Q2. Last year, Heidfeld used his heavier fuel load to get ahead of his team mate in the races but this has not proved possible this year, so close have the lap times been. If he can finish higher than Kubica tomorrow, he will put a question mark over the Pole's apparent supremacy this season and make Dr Theissen's decisions on drivers for 2009 that much harder. Say what you like about the bearded German, he is a fighter and comes through when you least expect it. In sixth appeared the amazing Alonso, somehow wrestling the Renault well ahead of his team mate, the Toyotas and anyone else who dreamed of challenging BMW's position as third best team. Toyota slumped from their recent form, ending up eleventh and thirteenth, with Piquet separating them in the other Renault. The difference was entirely due to the ability of Alonso, his determination at the ragged edge in such obvious contrast to the lackluster Raikkonen's apparent acceptance of his dwindling fortunes. This year Fernando has proved his spirit and quality, regaining respect after the unsavory displays of temper last year. Behind these, Mark Webber made a very late charge into seventh on the grid, something that the Red Bulls had not looked capable of until that moment, and the Toro Rossos took ninth and tenth, Bourdais for once getting the better of young Vettel. Has the Frenchman at last got the hang of the STR3 and will we see a renaissance in his fortunes in these last six races? I hope so, since I am sure he is a lot better than his results would indicate so far. One has to feel sorry for the Honda drivers, still soldiering on with a car that has been given up on, but surely even more deserving of sympathy was Adrian Sutil, setting a time well ahead of Fisichella's and apparently safe, only to be demoted in the last few minutes of Q1. For a while, I thought Force India had survived the first round at last. Hooray for SeaBass! Let's hope he truly does have the new TR figured out and is begining to show his true worth. I'm still very skeptical of Nick (sorry Clive), he's shown flashes of ability before...and then fallen off. We'll certainly have a better idea after Spa & Monza. Hammy seems to have it all together, and Massa is staying true to form. Has Kimi given up? Sad if so. Hekki appears to be the ideal number 2. Reminds me of Massa during Michael's last years. The rest? Except for the suprising (at least to me) poor performance of Toyota, seems like the same old, same old. Should be a terrific race tomorrow.